Thailand is rolling out plans to legalise medical marijuana, an official told AFP Wednesday, as the country hopes to cash in on a multi-billion dollar industry with a product its supporters hail as some of the world’s best. But Thailand would be the first country in Asia to do so, tapping into a market that US-based Grand View Research has estimated could reach US$55.8 billion by 2025. A draft bill to permit its limited use has been sent to the military junta’s National Legislative Assembly (NLA). “We have submitted the bill to the speaker,” Jet Sirathraanon, chairman of the NLA’s standing committee of public health, told AFP, adding that it will have its first reading in the junta’s rubber-stamp parliament in less than one month. The cannabis would be “for medication only, not for recreation,” he added. He cited the revenue-generating possibilities that amending the laws would provide for Thailand as well as the beneficial effects it could have on patients in pain. He also praised the quality of the Southeast Asian country’s plants, which thrive particularly well in the Golden Triangle borderlands of Thailand, Laos and Myanmar. “I’m doing this because it’s an opportunity for Thai people,” he said. “Thailand has the best marijuana in the world.” Experts agree and see similar potential. 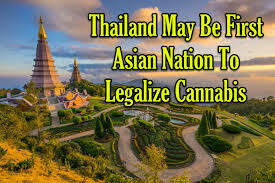 “Today, Thailand can produce awesome cannabis at a fraction of the cost of Western growers,” said Jim Plamondon, VP of Marketing at the Thai Cannabis Corporation, described as the country’s first legal marijuana firm.